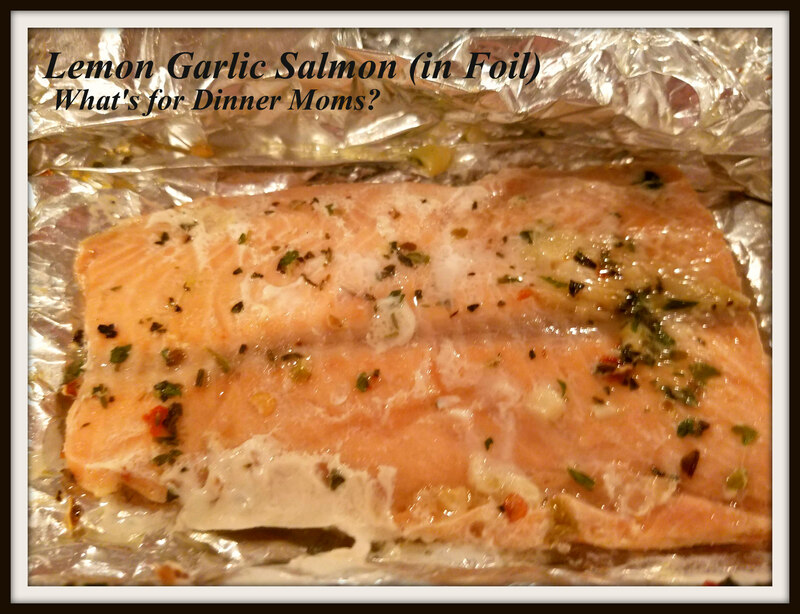 Lemon Garlic Salmon (in Foil) – What's for Dinner Moms? We don’t eat enough fish and seafood. I think that is something most of us could say. Being in the center of the US far from either ocean we tend to have more White Fish, Perch, and Walleye. We love fish and seafood but it seems so expensive that we rarely eat it. But, when we do we all say we need to have it more often. This was super simple to make and the flavors were really good. We served this over egg noodles with the butter and garlic from the fish drizzled over the top with a bit of Parmesan cheese sprinkled on it. Yummy! A super simple dish that is ready in no time! Preheat oven to 375 degrees. Line a rimmed baking sheet with aluminum foil. In a small bowl, whisk together butter, lemon juice, garlic, oregano, thyme, rosemary, salt and pepper, to taste. Place salmon onto prepared baking sheet and fold up all 4 sides of the foil to create a “bowl”. Spoon the butter mixture over the salmon. Fold the sides of the foil over the salmon, covering completely and sealing the foil closed. I haven’t had catfish in ages! That is the perfect recipe for me. I love salmon and all dishes which are simple and quickly made! Thank you! I need to cook salmon more. We have Salmon a lot. We usually pick up a big filet at Costco every other week then He-Man grills it after I marinade it. When Lobster is in season we get tails and He-Man grills those too. I make Lobster rolls with the left-overs. We don’t eat a big variety of fish which I know we should, but we only eat other fish at the sea and we don’t get there often enough for either one of us. Your marinade is very similar to mine so I know this was really good! This looks wonderful. Thanks for sharing.